My granny taught me to sew when I was 4-years old, and after 50+ years of sewing, and many sewing projects - including my eldest daughter's wedding dress - my favorite thing to sew are quilt tops! I keep my scrap bins sorted by colors, but that’s where my organization of the scrap bins end. I use photo boxes (eight in total) for each color and combine a few into one, like white, grey and black, to give you an idea of how many scraps I have. 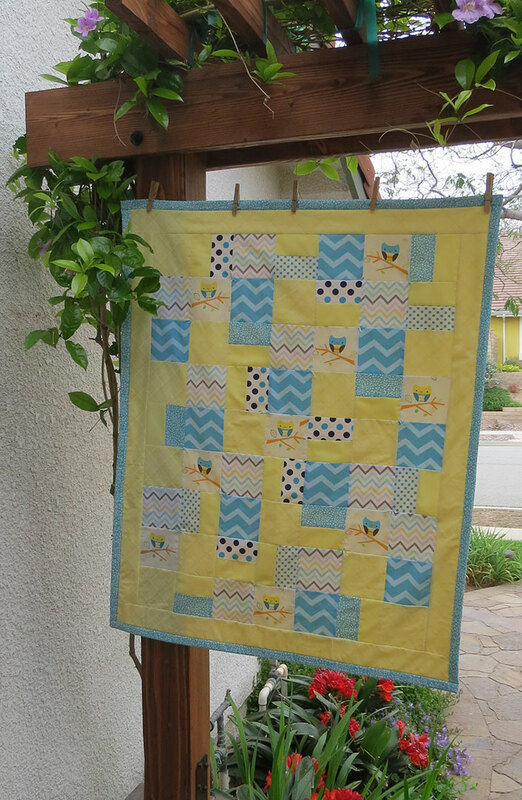 The idea for Three Little Birds started with a sweet bird fabric found at the local fabric store. There are three birds in the design – pink, teal and grey. 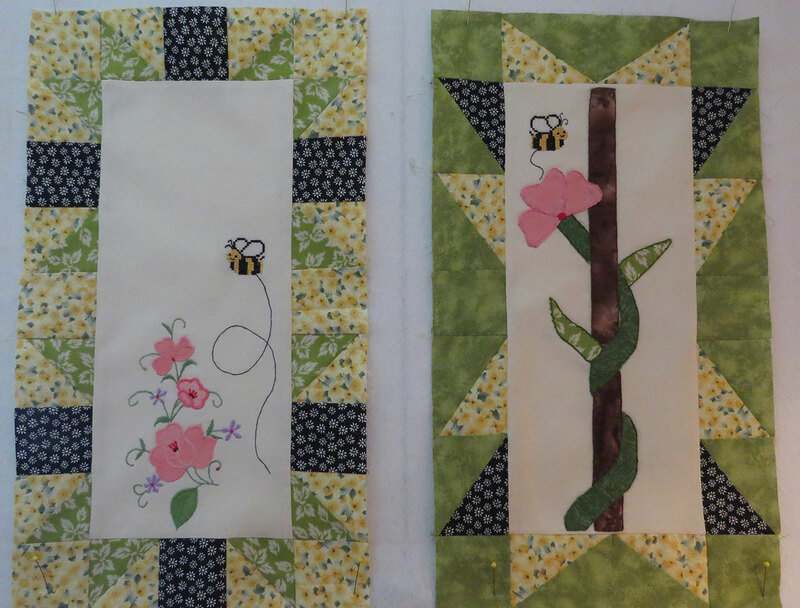 I sized them at 5″ (finished) and used them as the centerpiece for a recent quilt block I found called Bright Hopes. I sized the surrounding pieces at 2″ (finished). This is a really great pattern for a quick project or for someone just starting out, as it has few intersecting seams. 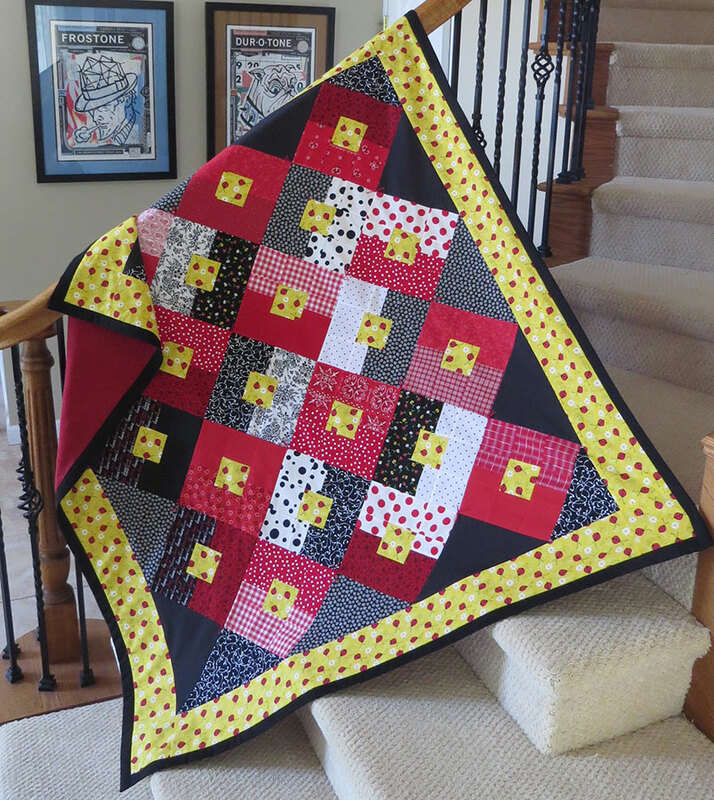 You can get the pattern over at Red Pepper Quilts. The name inspiration? The legendary Bob Marley, of course! I’ve only myself to blame. When I am at the fabric store, I am a sucker for a cute fabric, as well as for a good deal on remnant pieces. The fish fabric I pulled from the store’s half-off shelf, while the blue polka dot and the grey geometric were from the remnant bins. Since the goal of all my quilts is to incorporate ‘pieces of past’ fabric, I dug into my blue scrap bin to fill-out my palette. I personally like to be challenged, and try to be strong when life deals hardships. 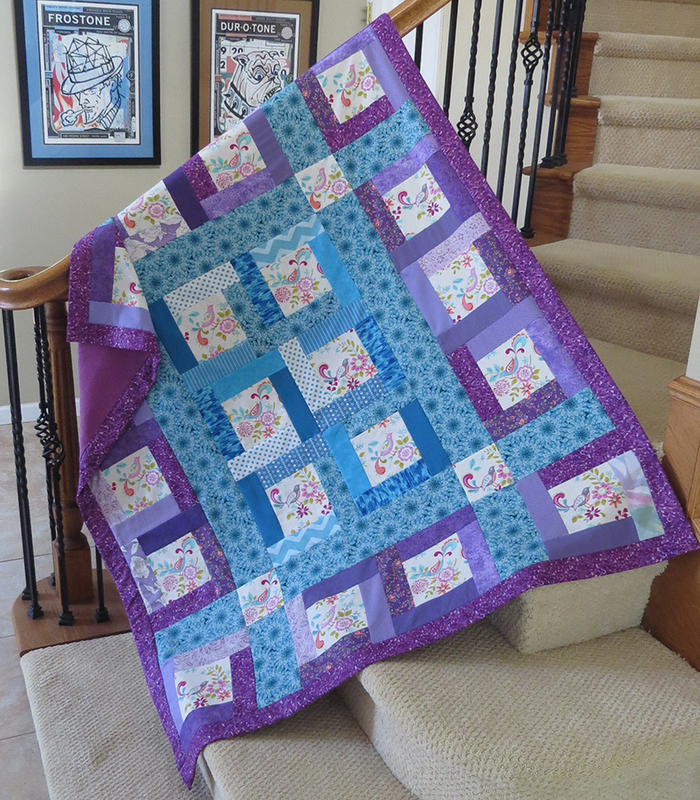 However, I cannot even fathom how hard it must be for the kids in the foster care system, and it is my hope that they can be strong and find some comfort from the love that I put into the quilt I made for them. 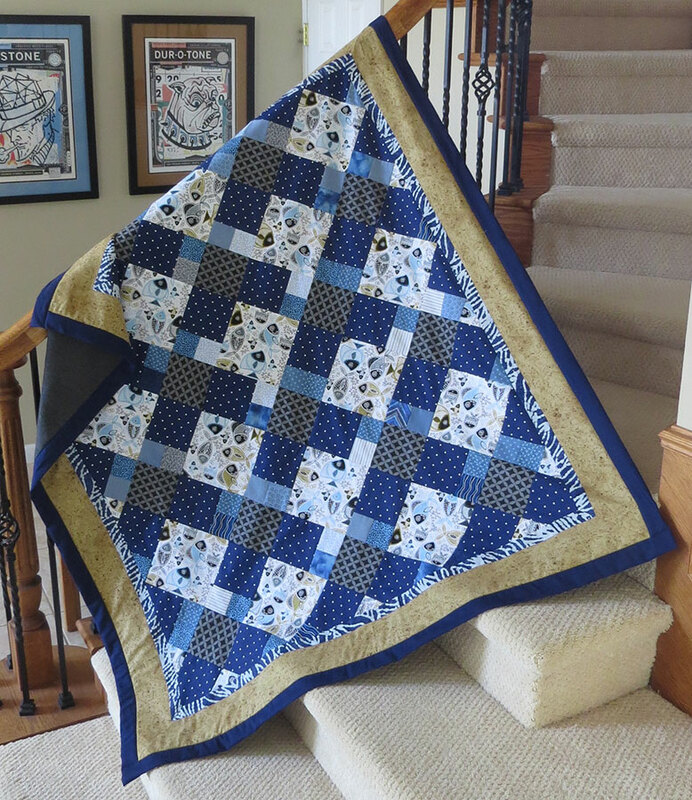 This is being donated to Little Lambs Foundation for Kids in Logan, Utah, as part of this year’s Hands2Help Charity Quilt Challenge. The Little Lambs Foundation for Kids provides comfort kits to children ages newborn to 17 years old who are transitioning into foster care, emergency shelter or who have been hospitalized. 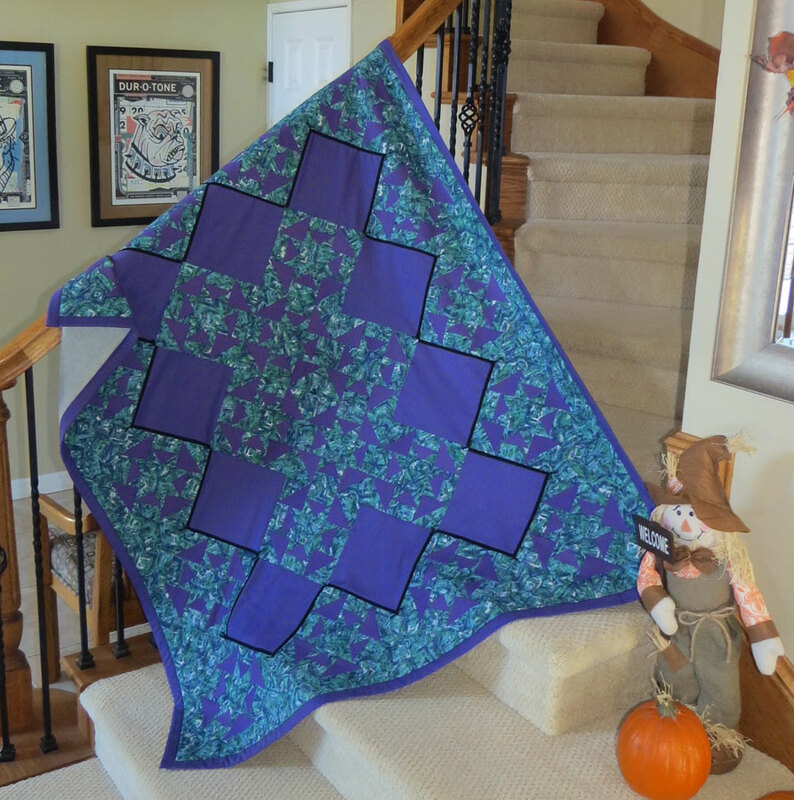 I don’t often do panel quilts, and I don’t often have UFOs, but this one ticked off both these boxes for me. I had found this flannel panel a few years back and thought it was too cute to pass up! I also figured it would be a super quick project. Oh, how wrong I was! From the start, this gave me grief. The panel had a strange wonkiness to its shape and was not a true rectangle. It was longer along its center top-to-bottom axis. I tried to compensate with the addition of the navy blue side borders, and adding tucks here and there, but this only further exacerbated the issue. I became so frustrated because I couldn’t figure out a way to correct the wonkiness that I put it away. This is slightly out of character for me since I am a full subscriber to a ‘just fix it’ mentality. 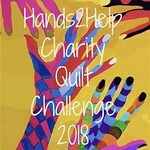 When I learned about this year’s Hands2Help Charity Quilt Challenge needing baby quilts for the Little Lambs Foundation for Kids, it energized me to pull out this UFO and get it done. I added a seam in the top of the center block, just below the traffic signal, which helped shorten the center length, allowing me to remove the previous tucks I had done in an attempt to fix the misshapen issues. 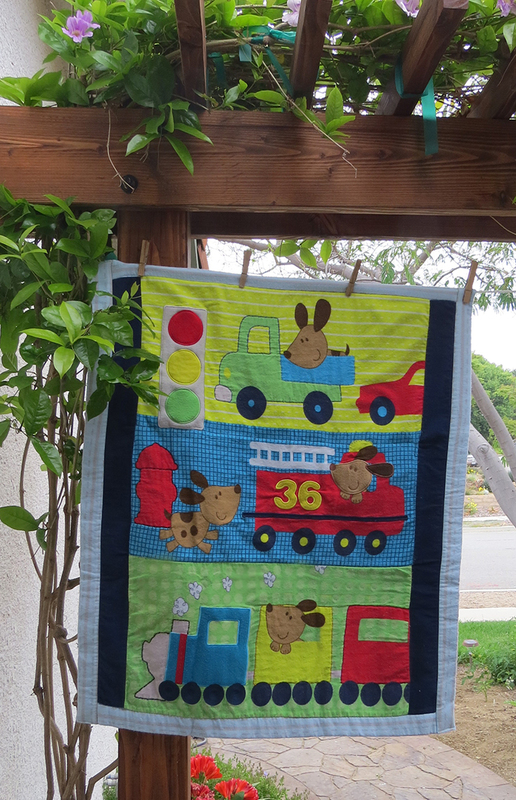 And while upon final inspection it is not perfect from a sewing standpoint, I think its vivid colors and playful design are perfect for a newborn. The Little Lambs Foundation for Kids in Logan, Utah, provides comfort kits to children ages newborn to 17 years old who are transitioning into foster care, emergency shelter or who have been hospitalized.